ABOVE: Peter Deilmann Reederei's MS Casanova. Important update: Peter Deilmann Reederei left the river-cruising business after the 2009 season. 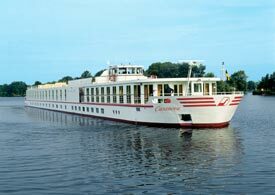 The Casanova, which is featured in this archived review, has since been acquired by Nicko Tours River Cruises (a long-established German cruise operator) and now offers bilingual itineraries on the Rhine. Peter Deilmann Reederei has operated cruise vessels on European rivers since 1983, when the Donauprinzessin joined the line's existing fleet of ocean ships. Today, the company has 10 ships on the rivers of Western and Central Europe, together with two luxurious ocean vessels: the MS Deutschland and the sailing yacht Lili Marleen. In fall, 2004, my son and I spent a week aboard the MS Casanova, a five-star river vessel that moved from Northern Italy to the Rhine, Danube, Moselle, and Rhine-Main Canal for the 2005 season and beyond. This illustrated review describes the ship, the service and amenities onboard, and the distinctly European style of river cruising that Peter Deilmann offers to cosmopolitan travelers. Photo copyright © Peter Deilmann Reederei. Used by permission.